Let’s talk about credible and approachable body movements. If you want to be more credible, again, when you are standing your head is erect. You’re not moving much. When you are talking to someone as your head is erect, if they make a point, you nod once only, as acknowledgment. Your chin drops, your head goes down, one brief nod. If a general is receiving a message, they are still, and nod once to acknowledge they got the message. They aren’t nodding and bobbing their head repeatedly. When you gesture for credibility, you gesture straight out ahead of you with one hand or both hands. You are gesturing straight out and normally it is palm down. As you are doing this palm out and down gesture, whether your hand is open or closed more into a fist, whether you have one finger or a couple fingers pointing, or whether it like a knuckle sticking out, when you have your hand in front of you if you want to have more credibility with that gesture, have your palm down. When you are doing this maybe your hand pats or pushes down. Let me ask you a question. If you were up in front of a group of ten thousand people and the PA system died and you needed to hush the crowd what gesture could you make so that everyone could see you and know that you wanted them to be quiet? You put your hands in the air and you pat downward, your palms facing down and would pat downward, right? This is an automatic gesture to tell people to be quiet and listen to me. If you want to be more credible in your movements when you are talking to someone and if you have your hand in front of you and it’s facing palm down and occasionally you move your hand in a downward gesture, it sends a psychological signal that says “be silent and listen”. It says “believe me I have credibility”. For credibility, you stand more strong, you have minimal movement, you hold your body erect. Your head is up, your gestures are straight out in front of you, palm down. That shows credibility and believe in me. Approachability on the other hand, the head is moving more, more nodding, bobbing. The gestures are more numerous, your hands are palm up or palm sideways, and you gesture in an open manner instead of palm down. There is more open gesturing, back and forth between you and the other person, or gesturing to the side. These types of palm up or palm sideways gestures go along with varying body postures, you’re erect but you also lean forward, and you move around a bit. You’re using your physiology-its friendlier and more approachable or charismatic. Blending together the signals of credibility with your voice tone, the way you speak, clipped tones down on the end of a sentence, and holding your physiology more still and erect, while gesturing palm down, head erect sends the signal “ believe me I’m credible”. On the other hand when you have a more friendly, open, positive tone of voice with more inflection to it, while you move around more fluidly and you gesture palm sideways or up, more friendly and relaxed, it signals you can like me. It’s more charismatic it’s more pleasant. Practice this, this skill to build your charisma and your believability. You can use this skill with people you have never met before and they will connect with you and give your greater credibility quickly. Knowing how to negotiate price, terms, and product delivery are some of the most essential steps toward getting to ”yes” in a selling situation. 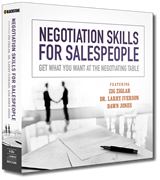 This multi-session audio program from seasoned sales experts offers negotiation training from a variety of viewpoints. Discover how to master your voice inflection, understand how to be assertive without being pushy, and learn the secrets to mastering price negotiations. Powered with these skills, sales professionals are proven to move complex deals forward in less time. For sales personnel in any industry, mastering negotiation skills is the ticket to earning more in your profession — and getting what you want!